As was previously announced this past summer, recent graduates Xiao Xue and James Fermor have been selected as the national and BC provincial winners (respectively) in the Bank of Montreal Financial Group’s 15th annual BMO 1st Art! competition. 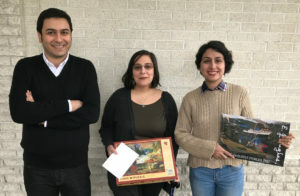 Their work was selected from 303 entries submitted from across the country, and both will have their work displayed as part of a special exhibition at the University of Toronto’s Justina M. Barnicke Gallery, running from November 16 to December 16, 2017. And both will be featured in a special spread in the upcoming Winter 2017 issue of Canadian Art magazine. As was earlier reported, Xue won the top prize in the Rainhouse Technology Challenge in June 2017, with her camper beating out other prototype entries including a drone, satellite and submarine. And, during her studies, she was also awarded the Dr. Milada Horakova Scholarship and the Martlet Chapter IODE Prize for Scholarship in History in Art. The $15,000 prize is “an amazing financial support for future projects,” says Xue, who is now pursuing her MFA at the University of Guelph and is using some of the proceeds for a “chemical-based project” on which she is currently working. “It certainly helped me move to Ontario as well,” she adds. 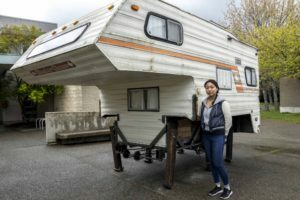 Local Times Colonist art columnist Robert Amos featured Xue’s walking camper project in this April 30 article, and while he wrote about both artists in in this October 8 article, he mostly focused on Fermor’s video art projects, which show the human cost of first-person shooter video games. And while the BMO exhibition will feature a colour photograph of Fermor’s “The Collection No. 3,” the overall work is in fact an 18-minute video. Indeed, Fermor says the inspiration behind his winning piece came from a fascination with “what we embrace, generate within ourselves and ignore” when we interact with specifically narrative-driven video games. “This piece came about from working with the game Dishonored 2 and thinking about what was going on between the fictional environment that I was enticed by the game to buy into and what was actually there,” he says. 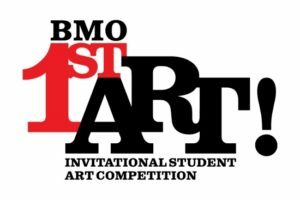 Celebrating its 15th anniversary in 2017, the annual BMO 1st Art! competition recognizes visual arts excellence amongst post-secondary school students from across Canada. Deans and instructors of undergraduate certificate, diploma, and degree arts programs from colleges and universities across the country were invited to select three outstanding graduating students from each of their studio specialties to make submissions to the competition. This year’s judges include Hugues Charbonneau, Director of Montreal’s Galerie Hugues Charbonneau; Naomi Potter, Director/Curator of Calgary’s Esker Foundation; Pan Wendt, Curator of Charlottetown’s Confederation Centre Art Gallery; Kim Simon, Curator of Toronto’s Gallery TPW; and Dawn Cain, Curator fo BMO Corporate Art Collection. The exhibit continues until December 16, 2017. Click here to see the winning entries by all the provincial winners. Try your luck with this Art History Christmas quiz! Like art? What about quizzes? How about art quizzes with a word-play twist? If you answered yes to any of these, then you’re in for a real treat: the return of the Art History Christmas Quiz! Designed by Art History & Visual Studies professor Marcus Milwright, the Art History Christmas Quiz was first mounted back in 2013. Like so many of us, the idea of spending the holidays doing a challenging quiz comes naturally to Milwright. 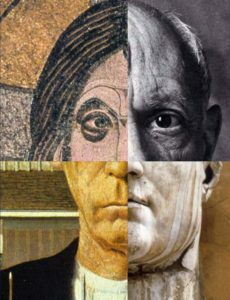 On each of the eight slides in the quiz, you’ll see a composite picture. 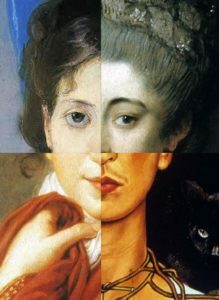 Identify each image, then follow the instructions to find certain letters drawn from the name of the artist, the subject, the name of the object, and so on. (For example, take the “g” from Van Gogh and add it to the “v” from da Vinci to reconstruct a series of words.) Click here for full contest rules and details. To take part in the quiz, write the completed words (or as many as you have been able to complete) on a postcard with your name and contact email. Hand this postcard into the main office of the Art History & Visual Studies department — that’s room 151 of the Fine Arts building — by January 5, 2018. Or if you’re on campus, you can send it by interoffice mail, or go really old-school and mail it in: AHVS Christmas Quiz, PO Box 1700, University of Victoria, Victoria, B.C., V8W 2Y2. 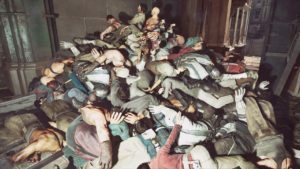 Looking for some visual assistance for the quiz? If you’re an AHVS student, you can access our DIDO image database; if you’re outside the faculty, try one of the public access sites like ARTstor, the Metropolitan Museum of Art or the website for London’s National Gallery. This quiz is open to all UVic students, and you may compete as teams (but only one postcard submission per team). There will be a main prize and two also for runners up. The winners will be announced on January 12. Remember, partial submissions will be accepted. And while the top three winners of the original AHVS Christmas Quiz were all AHVS students, don’t let that dissuade you from playing along. “It was really funny and exciting,” said winner Atri Hatef at the time. “I had some answers right away within each question, but often had to really search for the complete answer,” said previous winner Terry Rodgers. Congratulations to Hamed, Kirsten & Atri! Congratulations go out to the two winning teams of the 2017 AHVS Christmas Quiz: Atri Hatef & Hamed Yeganehfarzand, and India Cornell & Kirsten Matulewicz (not pictured). Not surprisingly, all are AHVS students—Hatef and Yeganehfarzand are PhD candidates, while Matulewicz and Cornell are Masters students. Both teams worked together to get the correct answers to as many questions as possible, and came closest to completing the entire quiz. In addition to gift certificates for a local bookstore, they also received some art-based Canadiana: a puzzle and a calendar! Celebrated School of Music alumnus Rodney Sharman was announced as the recipient of the $50,000 Walter Carsen Prize for Excellence in the Performing Arts on November 20. Awarded by the Canada Council for the Arts, the Walter Carsen Prize recognizes the highest level of artistic excellence and distinguished career achievements by a Canadian professional artist in music, theatre or dance. 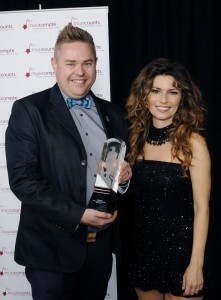 Established in 2001, this prize is only awarded to musicians once every four years. 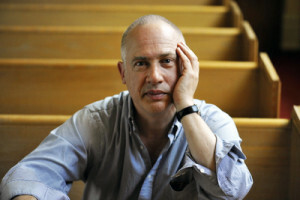 One of Canada’s most frequently performed composers, Sharman graduated from UVic with a Bachelor of Music in 1980 with a focus on composition, before going on to study at Staatliche Hochschule für Musik (Freiburg, Germany) and the State University of New York at Buffalo, from which he received a Ph.D. 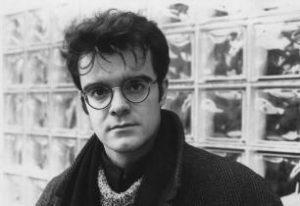 He was awarded first prize in the 1984 CBC Competition for Young Composers and Germany’s 1990 Kranichsteiner Prize in Music, Darmstadt. Originally from Biggar, Saskatchewan, but now based in Vancouver, Sharman is currently Composer-in-Residence of Early Music Vancouver’s New Music for Old Instruments. Among his many credits are a number of Composer-in-Residence positions with the likes of the Victoria Symphony, National Youth Orchestra of Canada and Vancouver Symphony, as well as having served as Composer-Host with the Calgary Philharmonic’s New Music Festival, Hear and Now. In addition to concert music, Sharman writes music for cabaret, opera and dance. He regularly writes scores for choreographer James Kudelka’s works at the Oregon Ballet Theatre, San Francisco Ballet and Citadel Compagnie (Toronto). 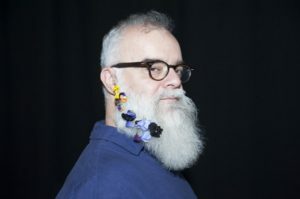 “I am touched, too, that my first dance collaboration with James Kudelka — Thrust — was dedicated to Walter Carsen in celebration of his 2000 Ramon John Hnatyshyn award for volunteerism in the performing arts,” notes Sharman. Recent premieres include Notes on “Beautiful”, a 2010 transformation of music by Stephen Sondheim for New York pianist Anthony de Mare, and Violin Concerto, for Jonathan Crow and the Victoria Symphony conducted by Tania Miller in 2011. 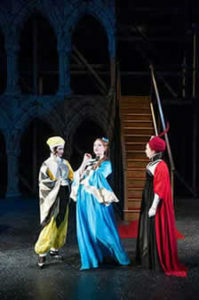 His chamber opera, Elsewhereless, with libretto and direction by Atom Egoyan, was performed in concert in Amsterdam, and has been staged 35 times since its 1998 premiere in Toronto, Ottawa and Vancouver. Sharman was also please to share the announcement with Montreal-raised cellist Vanessa Hunt, who won the $25,000 Virginia Parker Prize, which is devoted to an artist under 32 who shows outstanding talent. “Her parents and I went to the Victoria Conservatory of Music together. Vanessa is also a wonderful interpreter of my work,” Sharman told Vancouver’s Georgia Straight in this article. When Maestro Timothy Vernon raises his baton at the School of Music’s 50th Anniversary Gala concert on December 2, it won’t simply be in recognition of the Honorary Doctor of Music he received at spring convocation. Instead, his performance with the UVic Chorus and Orchestra can be seen as the culmination of five decades of academic expansion, faculty excellence, alumni achievement and dedicated community outreach by the School itself. 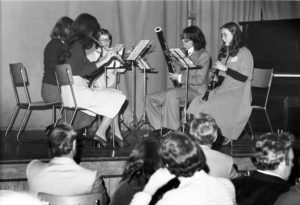 Music courses were first offered back in 1964 as part of UVic’s fledgling arts & humanities department, before evolving into the division of music in 1967 and earning full department status in 1969. But it wasn’t until the construction of the purpose-built MacLaurin B Wing—complete with the 220-seat Phillip T. Young Recital Hall—that the School was formally established in 1979. Since then, the School of Music has continued to expand, adding new faculty (including Butterfield himself in 1993), new programs (such as jazz in 1990), permanent artists-in-residence (the Lafayette String Quartet in 1991) and prestigious designations, like being Canada’s only All-Steinway School (2008) and offering the country’s only Music & Computer Science degree (2011) and Masters in String Quartet (2016). Join the School of Music in celebrating their 50th anniversary at their reunion weekend, running Friday-Sunday, Dec 1-3 at UVic. Events include an A Day in the Life at the School of Music Open House (noon-5pm Dec 1), Reunion Social & Dinner (5:30-11pm Dec 1), Music in Motion Workshop with Music professor Adam Con (11am-noon Dec 2), a Campus Tour for returning alumni & guests (12:45-2pm Dec 2), a special alumni concert From 1917 in 2017 with Kerry DuWors, violin, and Stephen Runge, piano, (2:30pm Dec 2), a fun participatory singalong with the Victoria Beer Choir lead by Adam Con at UVic’s Felicita’s Pub (4-7pm Dec 2), the UVic Chorus & Orchestra Gala Concert (8pm Saturday Dec 2), a Farewell Brunch (10am-noon Dec 3), and an Open Mic on stage at the Phillip T Young Recital Hall (11am-1pm Dec 3). Find out more about all the 50th anniversary events here. The UVic Chorus & Orchestra Gala Concert featuring guest conductor Timothy Vernon runs 8-10 p.m. Saturday, December 2, in the University Centre’s Farquhar Auditorium. Tickets are $10-$25 and are available at the UVic Ticket Centre, online or by phone at 250-721-8480. Can’t make the show? You can always tune in on the School of Music’s Listen! Live page. 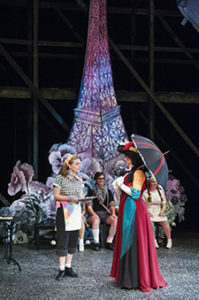 The reviews are in for Phoenix Theatre’s mainstage production of The Madwoman of Chaillot, and audiences are enjoying its “visual delights and thought-provoking observations,” as local arts writer Janis La Couvée writes in this review, which also highlighted the work of director and Theatre professor Conrad Alexandrowicz and his design team. Running until November 25 — with a special performance with sign language interpretation at 2pm on Saturday, Nov 18 — Madwoman is creating some wonderful dialogue and interesting feedback from critics and audiences alike. You can also now hear this online recording of the opening week lecture by Alexandrowicz, in which he talks about the background of the Madwoman as Jean Giraudoux’s response to the Nazi occupation of France. 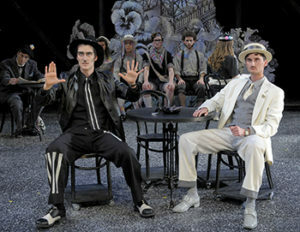 The Madwoman of Chaillot runs at UVic’s Phoenix Theatre, 8pm Monday – Thursday until November 25, with 2pm Saturday matinees. Tickets range from $15 – $26 and can be booked by phone at 250-721-8000, or in person at the Phoenix Box Office. Recommended for ages 13+.